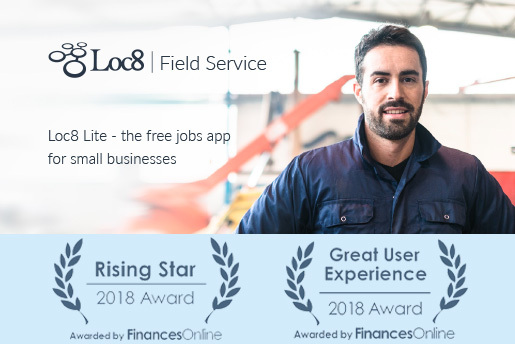 Field Service and Asset Management software provider Loc8 has been once again distinguished with prestigious SaaS awards: 2018 Great User Experience and 2018 Rising Star given by FinancesOnline, the popular B2B directory of software reviews. Loc8 also met their experts’ quality standards as indicated in the review created by FinancesOnline and was therefore granted their Verified Quality Seal. This year again Loc8 has managed to demonstrate its ability to greatly support its users and to provide them with high-quality experience! After having released their newest edition called Lite last year, Loc8 is now strongly positioning itself as the main application for tradesmen, contractors and small business owners. Designed as a ready-to-use solution, this free for life edition dramatically changes the way service businesses manage their jobs, teams and financial activities. In the Loc8 review written by FinancesOnline’s experts under the top field service management reviews, they depicted a fairly accurate picture of the benefits and the main features of the application. User-friendly, intuitive and highly scalable, Loc8 users don’t require any training to use the system. After signing up, a whole team can be up and running using the app and create their first job within the first 15 mins. The best way to evaluate if this product is adequate for your business is to try it. The freemium package offered by the Lite edition allows companies with limited budget to integrate a robust system to their operations in order to improve their processes and deliver better service to their customers. For larger corporations with heavy asset management requirements, Loc8 also provides three advanced editions (Pro, Pro+ and Unlimited) to extensively assist them with maintenance planning, automation and financial management. FinancesOnline trusts Loc8 and recognises its high level of expertise in terms of Field Service and Asset Management, making it one of the most reliable applications in this space. Who better than a professional SaaS and B2B platform to give a true and valuable input about a piece of software like Loc8!